The Bank of Canada will make its final policy rate announcement of 2014 on December 3. No one expects BoC Governor Stephen Poloz and the Bank's Governing Council to make any change in the policy rate. It has been set at 1% since former BoC Governor Mark Carney completed a sequence of three 25 basis point rate hikes between May and September 2010. 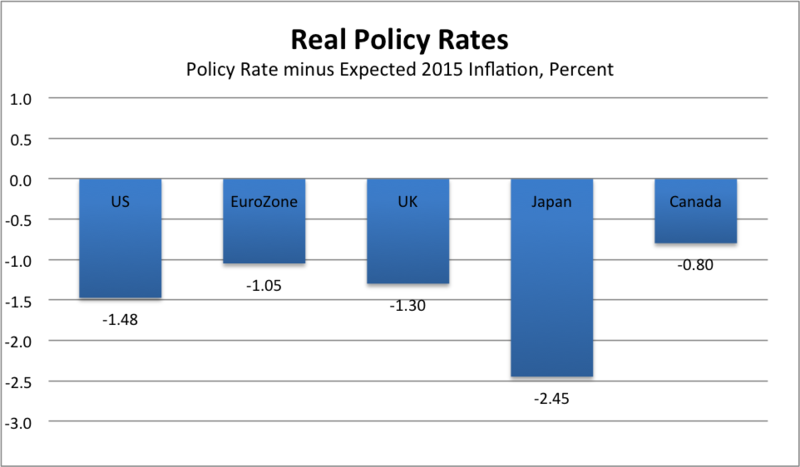 It should be noted that none of the other major central banks -- the US Fed, the ECB, the Bank of England, or the Bank of Japan -- raised their policy rates at that time (although the ECB did make that mistake in 2011). Indeed, each of those central banks have further eased monetary policy, either by reducing their policy rate or by expanding their balance sheets through quantitative easing (QE) since 2010. It is as if, in the monetary policy race, the Bank of Canada made a false start and stopped, while the other central banks ran the other way! Governor Poloz and his council do not make their decisions without considering what other central banks are doing. It cannot have escaped their attention that two of the major central banks, the BoJ and the ECB, are battling deflation pressures. The BoJ launched the most aggressive QE program to date in 2013 and just added another substantial dose at the end of October as it became clear that Japan had dipped back into recession. The ECB has introduced a negative deposit rate and promised to broaden its QE. The Fed ended its QE program in November and, along with the BoE made noises this summer about raising the policy rate in 2015. But with the recent drop in oil prices and general global inflation pressures, both Fed Chair Janet Yellen and BoE Governor Mark Carney have reassured markets that no early tightening is being contemplated. But, OMG! Canada just reported that the total CPI inflation rate in October was 2.4% and the Core CPI inflation rate was 2.3%, both above the mid-point of the 1-3% target range. Inflation hawks, like the economists at the OECD, are recommending that the BoC should begin another round of policy rate hikes within six months. Well, that would be a mistake! Since the beginning of 2008, Canada's total CPI Inflation rate has averaged 1.64%, well below the mid-point of the 1-3% target band. Eighty percent of that time, the core CPI inflation rate has been below 2%. If the Bank of Canada had hit the 2% midpoint of the target range since 2008, the total CPI would be 2.1% higher than it is today. That means that over the past seven years, the CPI has fallen a full year behind the target. 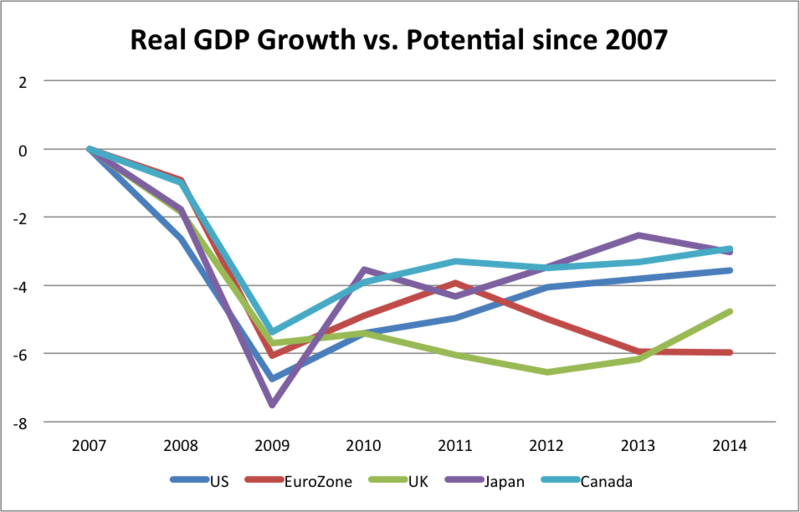 Recently, all major advanced economies have averaged growth well below their estimated potential. The chart below shows how much actual real GDP growth in the major economies has fallen short of the IMF's estimates of potential growth. Since 2007, growth in Japan and Canada has fallen 3% short of potential, while the gap is -3.6% for the US, -4.8% for the UK and -6% for the Eurozone. Is it any wonder that the global economy is facing deflation pressures? As a consequence, most central banks remain focused on providing monetary accommodation or, at least, are reluctant to tighten policy. Canada's monetary policy is already significantly tighter than those of the other major central banks. One way to see this is to look at current real policy rates, defined as the current policy rate minus the currently expected rate of inflation in 2015. By this measure, the BoJ is the most aggressive central bank in fighting deflation (not even considering the impact of its massive QE program). The US Fed and the BoE remain highly accommodative. The ECB and BoC have the least stimulative real policy rates. Canada's inflation rate has been pushed up temporarily by the recent depreciation of the Canadian dollar, which has pushed up prices of some imported goods including clothing. But there is still substantial slack in the economy. Gasoline prices have fallen and a likely to remain lower. The weakness in the Canadian dollar is an appropriate response the the drop in Canadian commodity prices and the weakening in Canada's terms of trade. A temporary rise of inflation is both a necessary and desirable consequence of the currency weakness for a country that has persistently undershot its inflation target for seven years. Governor Poloz should ignore the OECD and resist the temptation to react to an upward blip in the inflation rate. He should follow the path taken recently by BoE Governor Carney, not the path taken in 2010 by then-BoC Governor Carney. Fact check: ECB hiked their refi rate by 25bps on Apr 7/2011, and by another 25bps on July 7, bringing the rate up to 1.50%. Unlike the BofC, they were forced to cut by November, and are now down to 5bps, with their deposit rate now negative. Hi Greg! You are absolutely right as noted in the corrected version. This move by the ECB was what I call "Trichet's Folly". But it doesn't change my comment that "each of those central banks have further eased monetary policy, either by reducing their policy rate or by expanding their balance sheets through quantitative easing (QE) since 2010." Trichet's folly is right. The second hike marked the beginning of the European sovereign debt crisis. 10 year Italian CDS blew out from 220 to 580 bps in the subsequent 2 months, and have only got back to the 220 level in the last few days. And I agree, the ECB experience in 2011 actually strengthens your case for central bank caution.